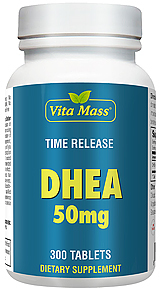 Dehydroepiandrosterone (DHEA) is produced naturally by the adrenal glands and supports immune function and a healthy mood. DHEA and Resveratrol function as buffers to help counteract effects of environmental stress. has added Resveratrol, a nutrient found similarly in the skin of grapes and as a component of red wine, to help support vitality as you age. Other Ingredients: Modified cellulose gum, gelatin, vegetable stearic acid and vegetable magnesium stearate. Not contain: Milk, eggs, peanuts, tree nuts, crustacean shellfish, fish, soy, gluten, titanium dioxide.